For me, one of summer’s great joys is scarfing down mass quantities of berries and stone fruits. Another one of the season’s pleasures is sitting in a shaded spot, curled up with a good book. When the two converge? Serendipity. Last week, the fruit box delivered by my CSA farm was packed tight with eight pounds of sweet cherries. My husband, son, and I stuffed as many into our mouths as we could. Immediately. When we wiped the red juice from our faces, though, we still had quite a few cherries left. Enter, The Good Luck Girls of Shipwreck Lane, the delightful debut novel by Kelly Harms that I happened to be reading. Good Luck Girls is about two women with the same name who both show up in Maine believing they’ve won a dream house from a cable home network. Rough-and-tumble Janine “Nean” Brown is desperate to escape a string of abusive boyfriends and minimum wage jobs. The other Janine Brown, who goes by Janey, gets practically dragged to the coast by her energetic, eighty-eight year old Aunt Midge, in an effort to snap Janey out of a bout of grief and agoraphobia. 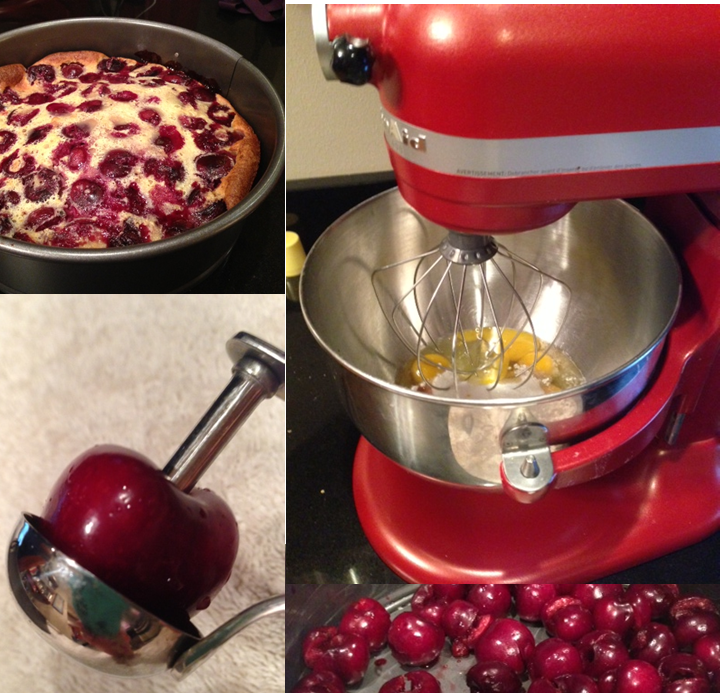 As a girl with a surplus of sweet cherries is bound to do, I Googled the recipe. After some cupboard raiding and a whole lot of cherry pitting (which I found, incidentally, to be oddly therapeutic), I had a springform pan of cherry clafoutis in the oven. While I waited for the confection to bake, I contacted Kelly, who lives in my hometown of Madison, to see if she’d answer some food-related questions for the blog. She was kind enough to oblige. I hope our discussion makes you hungry for summer treats of both the culinary and literary kind. GOI: How did you get the ideas and do the research for the many different foods mentioned in your book? Kelly: It all came from the seasons in which Janey was cooking and my shelf of beloved cookbooks. When I wanted fancier than I actually cook myself, I turned to Charlie Palmer. For Aunt Midge’s eating habits I liked Joy of Cooking. For baking, Dorie Greenspan. For most of the deeper food research I clung to my McGee. GOI: If you had your dream kitchen, like Janey gets hers, what would it include? What would the fridge be stocked with? Kelly: A chest freezer, fer sure. Summer plus my tiny side-by-side freezer gives me agita. As it is, I put food by with a canner whenever I have the urge to slave over four hot burners for ten or twelve hours straight. The fridge would be stocked with good eggs, fresh pasta made by someone else very recently, and this morning’s spinach. A perfect pound of sea scallops dry on ice. Maybe a ball of mozzarella, and some perfect August tomatoes nearby too. Basil and dill growing in the window. GOI: Do you prefer to cook (like Janey) or to bake (like Nean) and why? Kelly: Cook, like Janey. I prefer savory food to sweets and eyeballing to measurements. An exception is made for pie. Thanks, Kelly, for talking with Glossing Over It! In case anyone is wondering, the cherry clafoutis was delicious and surprisingly easy to make, other than the time-intensive pitting of all the cherries. The recipe I used was from Bon Apetitit and can be found here. 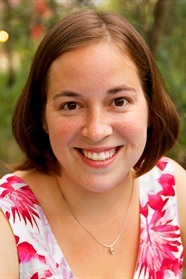 KELLY HARMS is a former editor and literary agent who has worked with a wide array of bestselling and award-winning authors of commercial fiction. She traded New York City for the writing life in Madison, Wisconsin, where she lives with her adorable and sometimes imperious toddler Griffin. The Good Luck Girls of Shipwreck Lane is her first novel. Yum. We ordered half a case of cherries from our CSA at the beginning of the summer, and they were delicious. Now I find myself wanting more! I did end up dehydrating many of them, though, so I can eat them year-round. Well, as long as the bags, last, at least. I don’t think it’ll take a whole year. Fun interview, too! I always love books about cooking and baking. I may have to check this one out. Thank you for having me on your much-more-fashionable-than-I-could-ever-hope-to-be blog, Susan!